Monitoring structural stability in urban areas and large infrastructure networks is emerging as one of the dominant socio-economical issues for the safety of the population. The problem is stressed by the growing age of the constructions, exposed to increasing risks due to the material deterioration and loss of loading capacity. This becomes a civil protection issue when the structures are threatened by the evolution of natural and man-made ground deformation processes. In the latter case, the monitoring system is strictly devoted to safeguarding the population and has a primary role in setting up mitigation and prevention actions, as well in the implementation of an alert system. To date the evaluation of risks associated with the deformation of a structure use ground based methods, able to measure displacements at the surface or in boreholes, and on direct analyses such as in-situ inspections/investigations. These methods, although accurate at a local scale, require positioning devices on the structures (destructive method) that are expensive and not always feasible due to accessibility and logistic constraints. In addition, due to the extension, capillarity and frequency are required for the monitoring of large urban areas, critical infrastructures (plants) and networks extended at a national scale (road, railway, airport), an approach based only on in-situ measurements would require huge resources, not available today. To guarantee a systematic and comprehensive control of structural stability over large areas, satellite remote sensing can be effectively adopted. However, the processing chains and the specifications for analyzing and reporting the outcomes of satellite-based investigations still need to be even better defined, validated and made coherent with the standards expected by the reference user community. Among the different methods based on passive and active satellite sensors, the Differential Interferometry SAR technology today represents an adequate alternative solution in terms of providing data that, for precision, reliability and cost sustainability, can be fully assimilated within the monitoring approach based on in-situ data. 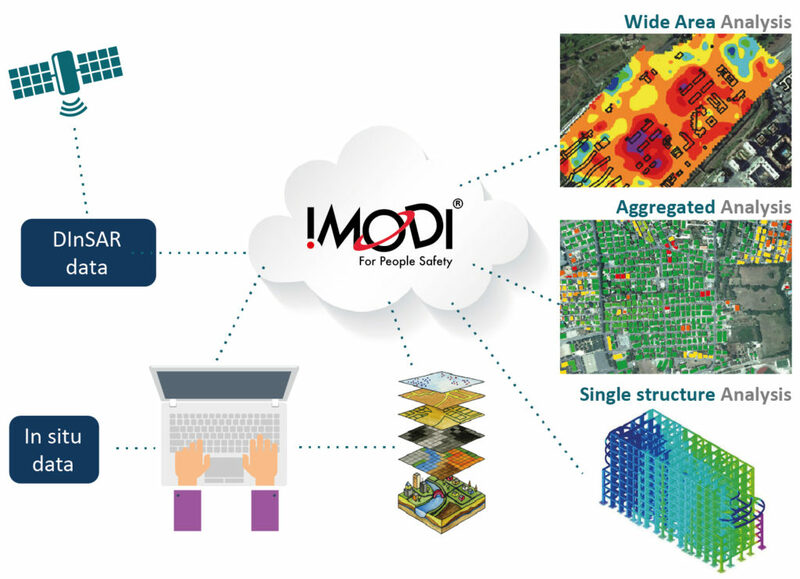 The I.MODI project (Implemented MOnitoring system for structural DIsplacement) aims to exploit the business opportunity generated by the increasing need to have a systematic monitoring system able to detect the stability of buildings in large urban areas and to control critical civil infrastructures (such as dams, highways, airports etc) threatened by natural and man-made processes. It focuses on the exploitation of Earth Observation data to create an added value service where the integration between EO technologies, aerial, ground based data and ICT represent the core of the system and becomes easily accessible from users. The service is able to cut across different market segments through the development of customized applications that encourage more flexible insertion in the standard monitoring procedures. The feasibility of the service was already defined within the BIC-ESA incubation project Mo.DI. (MOnitoring urban area by means of long-term DInSAR time series) during which the service architecture was designed and initial business and commercialization plans were developed. Following Mo.DI. achievements, I.MODI will demonstrate the factual application of the service. It concerns the use of DInSAR data to examine structural stability, to perform an assessment on the level of damage suffered and to evaluate future evolution. A web-based customized service will be set up to completely integrate the EO data within the standard procedures based on in-situ technologies (GNSS and ground surveying). EO and non-EO inputs will be linked and managed adopting open standards for data documentation and using ICT technology to furnish an added-value service to final users (companies, professional operators as well as private citizens). Full-scale tests and validation activities will be conducted in collaboration with final users, including public authorities and private companies.